The problem is the Energy sector cannot rise 3.7% per day every day in order for the S&P 500 to post a flat session. The Decliners led Advancers in the broadly based Russell 3000 by 2.5 to 1, so we know today was by no means a flat performance for investors. The action masked the real pain being incurred. We thought Crude would have peaked by now. Watching the Commodity on the cusp of a breakout above $140 is definitely a major concern. We believe Energy, just like most commodities, will be a victim of its own success. Energy prices at the current levels are inconsistent with sustained economic growth, not only domestically, but also globally. At some point in the near future, this will register in the Equity Market. A notable push lower in Equities is what will be necessary to prompt the Energy market to recognize it. Essentially, the action in Energy is insuring that the Equity market will need to go lower before it can go higher. Cash remains king. Good to have cash to buy cheap foreclosed properties. More about that tomorrow. "The IRS is SO stupid." My son, Michael, rants this morning. Apparently he filed electronically -- in plenty of time. He was proud. His first time not using the family accountant. Weeks later he received a demand for $45 "late filing interest." He pays it. It was "easier" to pay it than to complain, he explains with his impeccable logic. They cashed his check. Yesterday he receives a letter from the IRS telling him they're deducting $45 (another $45) from his $600 "economic stimulus check." I explain to Michael that Bush's economic stimulus package is designed to stimulate the IRS, not him. He doesn't think this is funny. Sorry about yesterday. I didn't get the software coding on yesterday's site right until about 9:30 AM. What messed it up was the table for Wimbledon's TV schedule. I stole the table from TennisWarehouse.com. I don't buy much from them, however. I get good prices and ultra-fast delivery from Fromuth (800-523-8414). F4: The best Excel button: It simply repeats your last Excel command. You just inserted a new line. Want to add another one? Hit F4. This tip, courtesy Anne Himpens, certified Excel genius, and dear friend. Water on Mars. The first picture. This photo actually came from what appears to be an official NASA site -- http://apod.nasa.gov/apod/image/0504/WaterOnMars2_gcc.jpg. Some of us think this is funny. 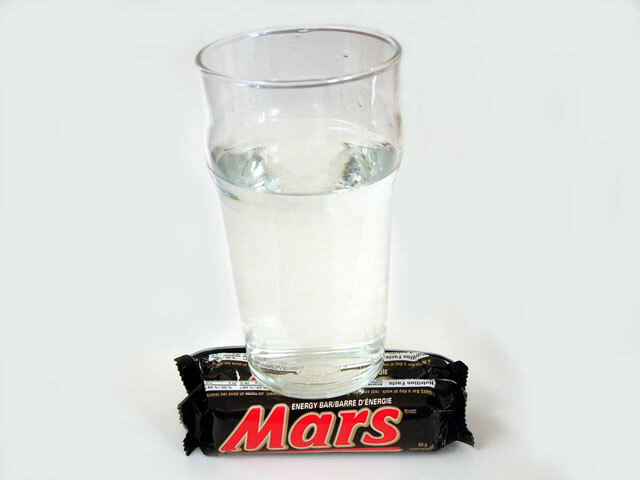 Some people at NASA must think the same... Drumroll.... here's the first picture of water on Mars. The Department of Water Resources representative stops at a Victorian Farm and talks with an old farmer. He tells the farmer' I need to inspect your farm for your water allocation'. The old farmer says "Okay, but don't go in that paddock over there." The Water representative says " Mister, I have the authority of The Federal Government with me. See this card? This card means I am allowed to go WHEREVER I WISH on any agricultural land. No questions asked or answered. Have I made myself clear? Do you understand?" The old farmer nods politely and goes about his chores. Later, the old farmer hears loud screams and spies the Water Rep running for his life and close behind is the farmer's bull. The bull is gaining with every step. The Rep is clearly terrified. The old farmer throws down his tools, runs to the fence and yells at the top of his lungs, "Your card! Show him your card!"